With hours to go until Call of Duty: Black Ops 2's launch, Activision has announced a new addition to the game's DLC Season Pass. This bundle of content will now include the Nuketown Zombies map as well. The Nuketown Zombies map is obviously for the game's zombie co-op mode. It was previously exclusive to the game's two Collector's Editions. I'd imagine many players objected to this content being exclusive to these limited edition bundles. The Season Pass entitles players to four multiplayer map packs. The Pass costs $49.99, so it's $10 cheaper than buying all of the $15 DLC packs individually. Nuketown Zombies will be unlocked for Season Pass owners on Xbox 360 in December. Other platforms will get it later on - probably a month later if earlier COD games are any indication. If you buy a Collector's Edition of Black Ops 2, though, you'll get the map as soon as the game launches tomorrow. 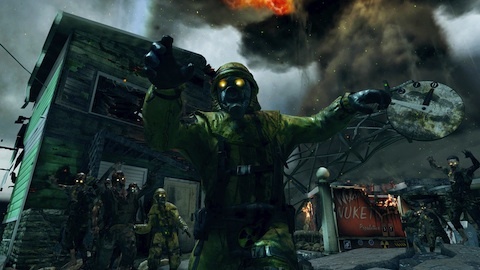 Accompanying today's news was a screenshot from Nuketown Zombies. Check it out below.